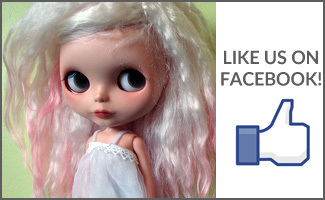 BlytheLife.com » Interview with Christine from Little Lovelies & Giveaway! 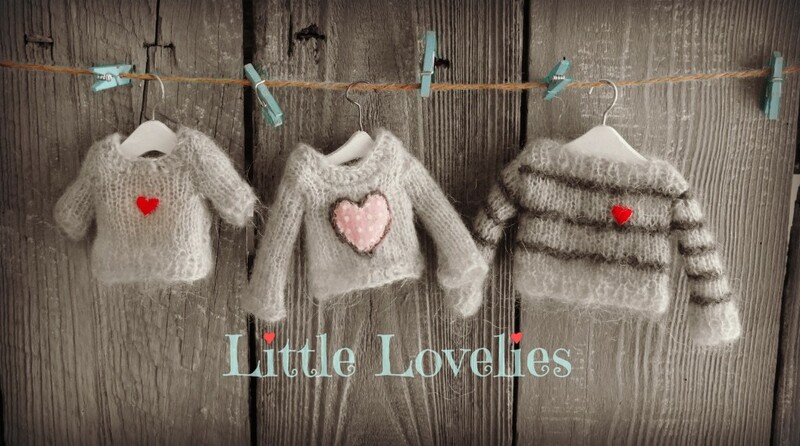 Little Lovelies is such a fun Etsy shop based out of Australia and ran by Christine. She does beautiful needlework and creates clothing for a “fashionable and luxury look”. I was so pleased to get to know Christine and now to share some things I learned about her with all of you! Hi Christine! Please tell us a little bit about yourself. I am a keen artist and crafter and always have been from an early age. My Nana taught me needlework when young and both mum and Nana taught me knitting and crochet. This sparked my creative yearning to make and create for enjoyment and for a living. I owned a rubber stamp shop for some years and learnt lots of different techniques with many materials and really found myself inspired. Now we have places to sell and share our crafts again I am once again enjoying my craft and excited to see so many people’s talent. I have written a children’s rhyme book Going to the Galaxy and love to do wild colourful paintings on canvas and mannequin bodies. Making small little lovelies for Blythe dolls is new to me since February this year. 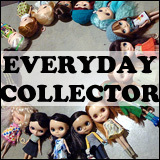 How did you discover Blythe dolls? Who is in your doll family currently? My long time stamping/arty/craft/talented friend Marina/PetiteAppleShop on Etsy has been my mentor and introduced me to Blythe dolls – and others. I was searching for a new creative interest and she said – go look at this – and gave me links to look at and read ad see and learn – and I was blown away. I immediately started knitting and embroidering again. I am also back to sewing after many many years of other crafts and arts. 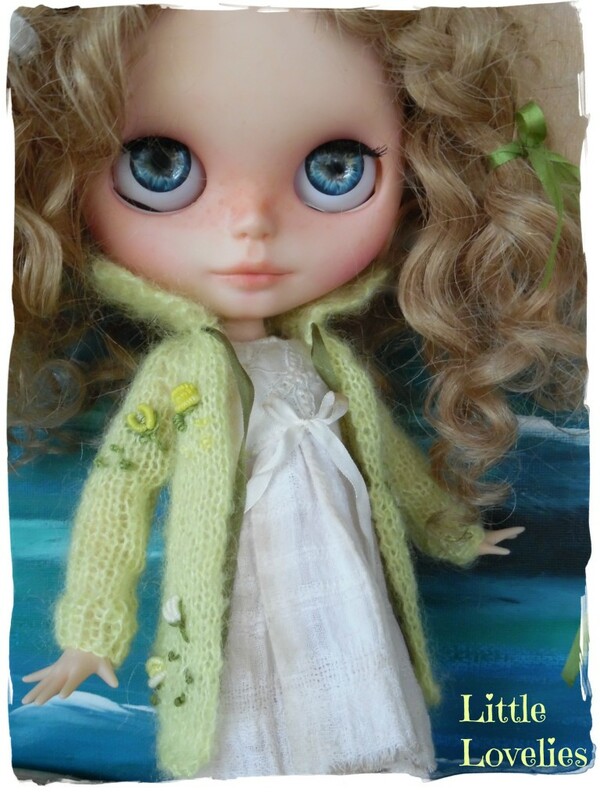 Marina customized my Blythe doll Lilith, who is my only Blythe so far. 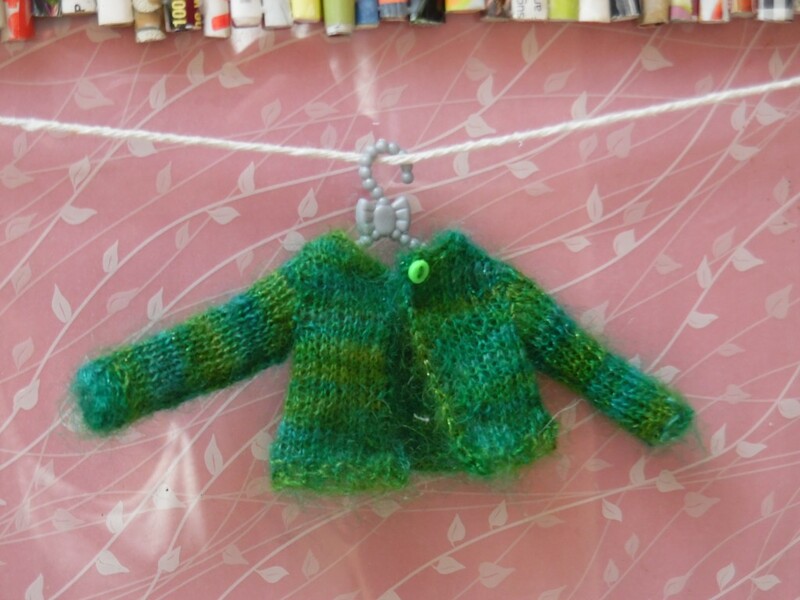 My first sale was a cute little variegated green cardigan in a lovely hand dyed mohair yarn. I was thrilled someone could like and want a garment I made and the sale came in fairly soon after listing, so that was exciting. I love creating and love that someone would want something I made. Very enjoyable. 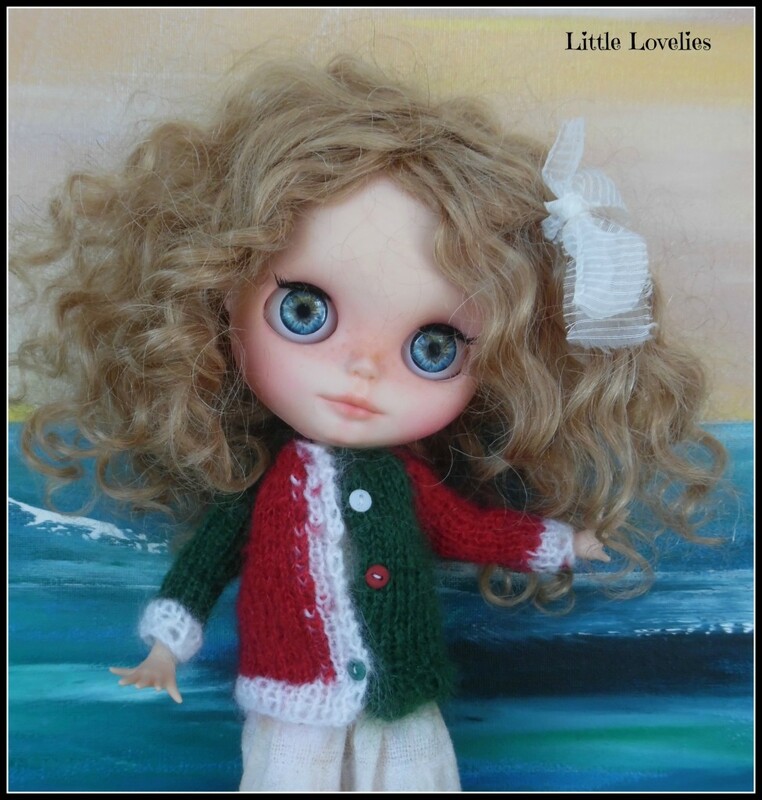 How has Blythe brightened up your world since you learned about the dolls and gotten Lilith? It has brightened up my life a lot as I work on the phone and wait for calls so now I have plenty to do and love the playing with fabrics and doing my embroideries again.. it all to do with colour for me and now my world is much more colourful and fun. I also enjoy seeing what others are doing and their creative ideas. Tell us a little bit about a regular day for you when working on items for Little Lovelies. I start creating a garment from fabrics for sewing a dress or top and skirt. Takes me ages to play with the fabrics etc and pick the right laces.. I really enjoy it. I am not so experienced at sewing so its slow but I usually make one each day and plan a new one. At night time I knit and embroider the little jumpers and cardigans and dresses. Again choosing colours and embroideries that will match dresses. I spend most of the day doing something for Blythe. Other times I am dressing Lilith and doing photo’s ready for selling and listing. Most of my day is taken up with some kind of activity for Lilith. In between I check out the websites and look at others peoples creations for joy and inspiration. 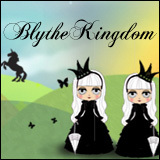 How has having a creative background helped you in creating for Blythe? Having knitted and embroidered for so long now I found this easy to adjust to. Making small items is so much fun as a project can be finished in a day. Having experience in the past has helped me create more things faster and make up new things. 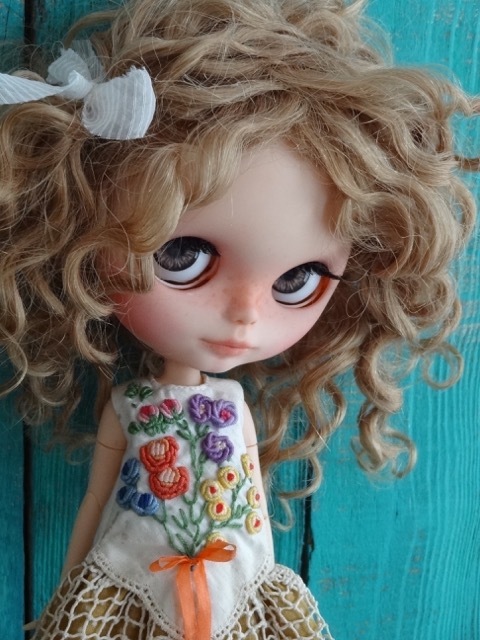 What would you say sets you apart from the other Etsy shops that sell Blythe items? I choose (as much as possible) rare and unusual fabrics, pure yarns that are hand dyed (mostly) and not always available. I hand dye my own laces and ribbons and hope to hand dye yarns soon as well, so these items will certainly be One of a Kind. I also see that not many people do Bullion stitch embroidery nowadays, which is 3 dimensional flowers on fabric and yarn. I don’t see anyone doing this type of embroidery for Blythe dolls so I hope it sets me apart and people will want to have some too. I also offer custom knits and embroideries so anyone can choose what flower on what garment in whatever colour they like. What has been your favourite piece that you’ve created so far? Did you wind up selling it or keeping it? My favourite piece is in the picture of Lilith with the dress on and lots of embroidered flowers. I did this piece some time ago, never knowing why mind you… then when Marina customized Lilith I sent the embroidery which was on an old handkerchief (that’s a strange word!) and I sent it for her to use. However, she made the lovely dress it is on and it displays my embroidery as well, I love it and will not part with that at all. Mostly because it is made from both of us. My first item on my own was a tiny green cardigan that sold first too. What’s coming up next for you and Little Lovelies? What’s next… anything, everything. I just pick up materials and yarns and make.. I am sewing dresses now too and am doing all sorts of different garments; nothing that I intend, but I end up doing. I am still experimenting with the creative process of sewing and putting colours and fabrics together. I hope to put embroideries on these as well and do custom work for people. I am also putting beading in the knits I am doing and shortly hope to have lovely beads inside flowers of embroidery. I have all sorts of ideas but whether it turns out or not is another thing! I love creating. Thank you for doing this interview with me, Christine! What advice do you have for someone who’s new to embroidery? Gosh! I cant imagine being new to embroidery… Patience with yourself, practice – your worst mistakes can turn out to be something wonderful: work with it. I begun so young and just kept doing some from time to time, learning new things when I saw them and just practiced til I was happy with it. Only teacher was my Nana and books. With the bullion embroidery I was struggling til I found someone who did it and had her show me a few tips. I was addicted, I love doing it. 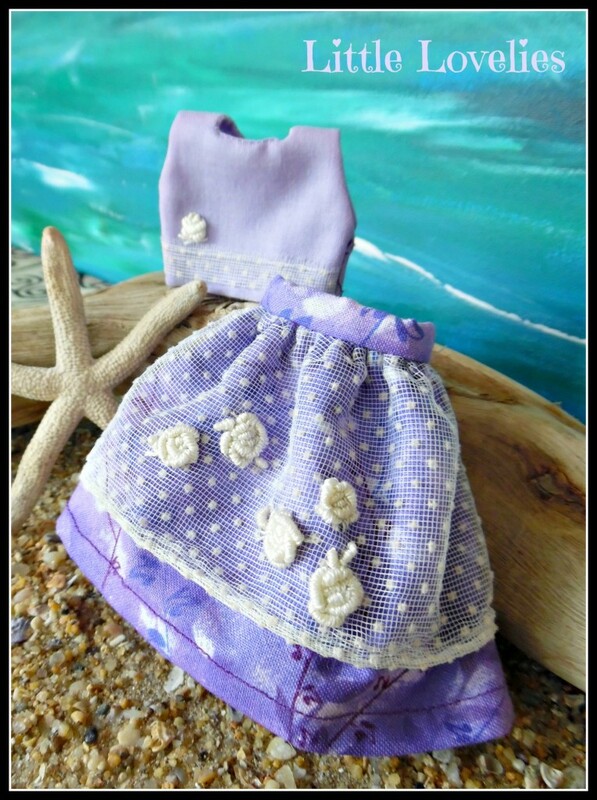 You can find out more about Christine and Little Lovelies on Etsy, Flickr, Pinterest, and Zibbet. Christine has generously decided to giveaway one Little Lovelies cardigan to one lucky reader here on BlytheLife! The giveaway runs until Saturday December 19th 2015 at 11:59pm Pacific. The draw will be held on Sunday December 20th 2015 and the winner will be announced on BlytheLife.com. Remember to use a valid email address for all comments. If you win, your email will be forwarded to Christine so she can get in contact with you regarding sending you the prize. The embroidery on these are beautiful! Your embroidery works are so delicate and beautiful. Congrats!